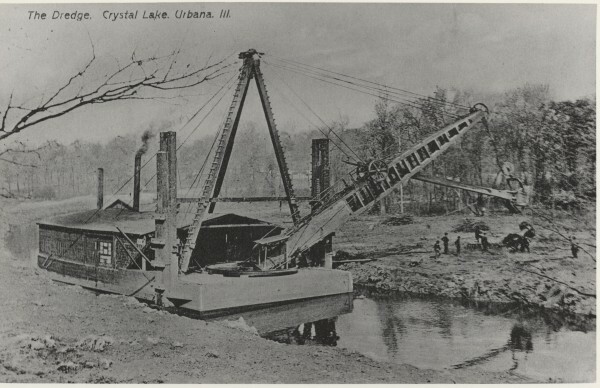 The Dredge boat is shown creating Crystal Lake Park (please note size of the dredge in comparison to the men on the shore). The undated photo is H.S. 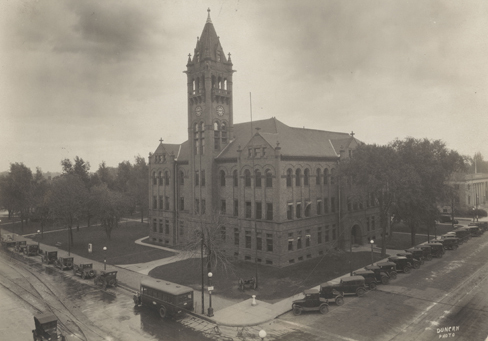 (Historical Society) Photo #227a, and it is part of the collection available at The Urbana Free Library in the Champaign County Historical Archives. Click on any of the titles below to view the picture. Urbana Flat Iron Building - "Flat Iron Building (Urbana, Ill.)". Photographs Envelope - Located in the Local History Photographs Collection in the Champaign County Historical Archives of The Urbana Free Library, Urbana, Illinois. 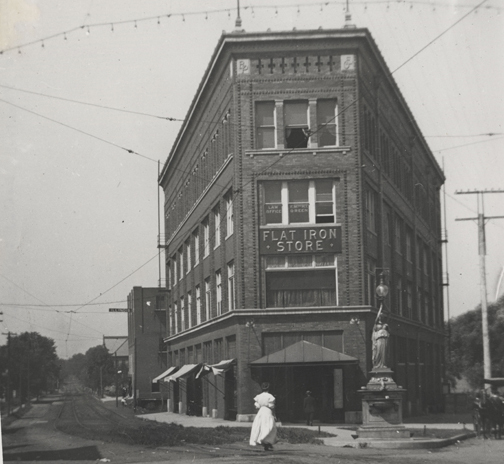 On the back of the photo is written: "Illinois Theatre behind Flat Iron Building." 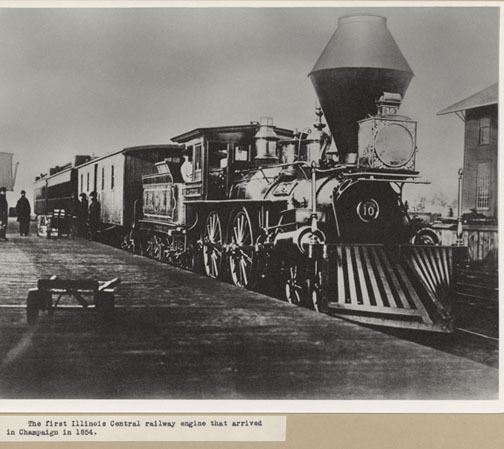 First Illinois Central Railroad engine - 1854 - The first Illinois Central Railroad engine that arrived in Champaign, 1854. H (Historical Society) #177b - located in the Champaign County Historical Archives in The Urbana Free Library, Urbana, Illinois. Champaign County Courthouse - "Champaign County Courthouse (Urbana, Ill.: 1837-1900)". Photographs Envelope--Located in the Local History Photographs Collection in the Champaign County Historical Archives in The Urbana Free Library, Urbana, Illinois. Dredging in the 1890s - "Dredge boat in the Wildcat Slough 1/2 mile north of Dewey in the late 1890's. Mr. John Fink is sitting high on the machine. Mr. Charley Lewis, the owner, is standing on right side of picture. Picture owned by Mrs. Virgie Asherman, Dewey, (ILL)." (Historical Society) H #414b - located in the Champaign County Historical Archives, Urbana, Illinois. 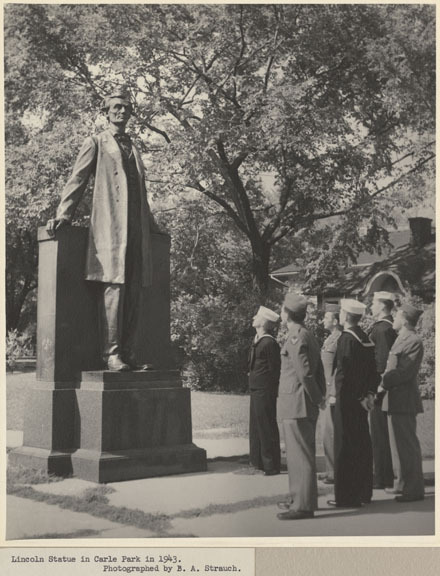 Lincoln Statue in Carle Park - "Lincoln Statue in Carle Park, Urbana, 1943". (Historical Society) H#95a in the Champaign County Historical Archives Local History Photographs Collection. The Archives is in The Urbana Free Library, Urbana, Illinois.